Language is a means to understand and exchange thoughts, to bond and share with cultures. Therefore learning a language means reaching out and bonding with our fellow citizens. Urdu too is a language of Indian origin and a part of our history. The Bhartiya Bhasha Sangam Project is meant to encourage the learning of at least one language other than one’s mother tongue. Just like the confluence of rivers, the languages will unite and pour in together the variety in us… and what will emerge is the oneness, the unity of humanity. Sadguru Shree Aniruddha Bapu Himself conducted classes to teach Marathi to bhaktas hailing from regions other than Maharashtra. The sessions continued over three years. The students of these classes were encouraged to learn a language other than their own mother tongue and Marathi of course. The volunteers from the Foundation conducted teaching classes in multiple languages from various parts of India and taught it to others from the Foundation to whom they were not known. 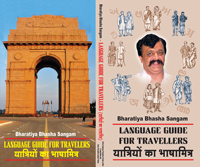 A travel guide that contains help tips in Hindi, Marathi, English, Gujarati, Kannada, Malayalam, and Telugu for anyone touring the country has been published under this project. This guide gives equivalents in all the above languages and covers just about all that a person stranger to the land and to the local language would need to know to find his way around and ensure his safety and joy.